The rotary tool is one of the most versatile tools you could own. 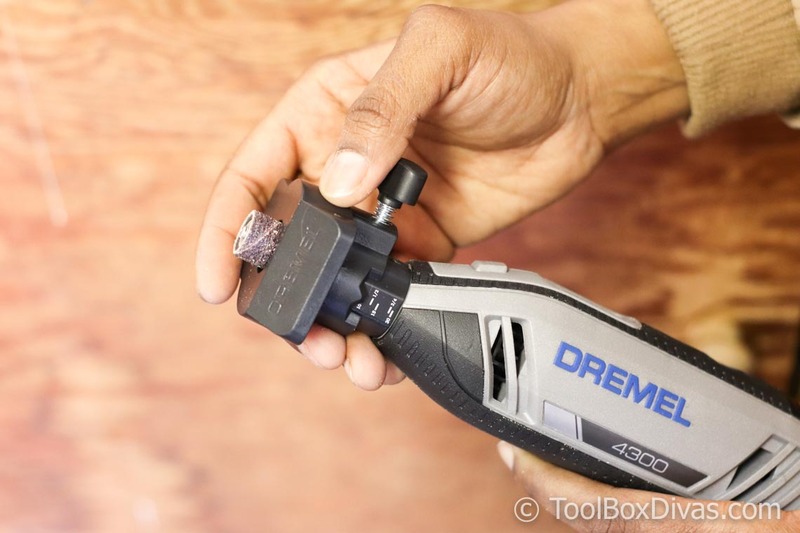 In this post I’m going to share with you the DREMEL 4300 SERIES 1.8 AMP VARIABLE SPEED CORDED ROTARY TOOL KIT and the many accessories that can be used with the rotary tool. You might be asking what is a rotary tool. Well, it’s a small handheld power tool that is paired with an assortment of attachments that enable the user to use it in a variety of ways. Some of the tasks or activities that can be accomplished using a rotary tool include sanding, grinding, polishing, etching. You can even sharpen knives with a rotary tool. In the past, I’ve used a rotary tool to etch labels in the glass in less than 10 minutes. Step by step instructions on how to etch glass in less than 10 minutes, using 1 tool, the rotary tool. I’ve even used a rotary tool to distress wood that I used to create a faux wood beam mantel. What is the best rotary tool? One of the best rotary tools on the market today is the DREMEL 4300 Series 1.8 Amp Variable Speed Corded Rotary Tool Kit with Mounted Light, 40 Accessories, 5 Attachments, and Case. It can be used for cutting, sanding, grinding, drilling, etching, carving and so many more applications. It’s Dremel’s most powerful 1.8 Amp motor rotary tool. And it’s definitely the most versatile on the market today. This rotary tool comes with a ton of accessories including a removable pivot light. The Dremel 4300 comes with a 2-year manufacturer’s warranty. The number of accessories that are available for the Dremel 4300 Series rotary tool is endless. However, these accessories take the Dremel 4300 to the next level. DREMEL Flex-Shaft Attachment for Rotary Tool (pairs with Dremel Rotary Tool – Made for really tight spaces and super detailed work. It has a 36 in. long cable with 5 in. bend radius for more flexibility. The Dremel Flex- Shaft can be used with most corded rotary tools. It’s smaller in size than the 4300 series so for some it’s easier to hold. DREMEL EZ Lock Sanding and Polishing Mini Kit for Metal, Steel, Wood, Brass, Aluminum, Plastics, and Vinyl (7-Piece) – While this attachment doesn’t come with the Dremel EZ Lock Rotary Tool Mandrel, used for attaching the pieces, the Dremel 4300 comes with it as apart of its accessory kit. This sanding and polishing kit is used to clean, polish, smooth or restore materials like metal, steel, wood, brass, aluminum, plastics, and vinyl. DREMEL EZ Lock and Drum Sanding/Grinding Rotary Tool Accessory Kit (18-Piece) (pairs with Dremel Rotary Tool -I can honestly say I use this accessory kit the most. It’s all-encompassing with 2 mandrels, 6 sanding discs, 2 grinding stones, and so much more! DREMEL EZ Lock Cut-Off Wheel Set for Metal and Plastic (11-Piece) (pairs with Dremel Rotary Tool – This set includes 10 wheels and 1 mandrel for metal and plastic cutting. It’s compatible with all Dremel rotary tools. Overall I really like this rotary tool. The DREMEL 4300 Series 1.8 Amp Variable Speed Corded Rotary Tool Kit with Mounted Light, 40 Accessories, 5 Attachments, and Case comes with a variety of attachments. On the bright side, it’s powerful and is a really great value. The only set back is it’s corded. But with the attachment of the Flex-Shaft Attachment, it’s capabilities and versatilities increases. All of the attachments make this rotary tool a must-have for woodworkers, craftsman, and homeowners alike.